1778: born in Urawa-shuku , a station on the Nakasendô. Beginning of the Bunka era: he becomes a disciple of Katsu Hyôzô I, who gives him the name of Katsu Hidezô. He switches to Katsu Danzô at unknown times. 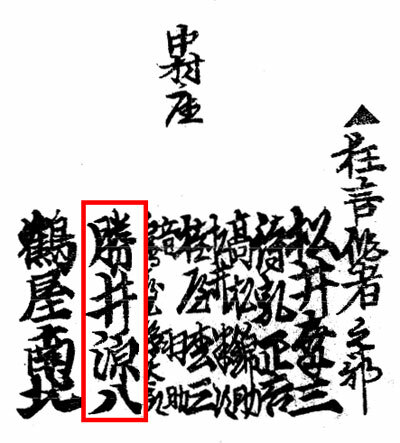 11th lunar month of 1810: he takes the name of Katsuura Shûzô (in fact it is his real name!) and works with his master at the Ichimuraza on the kaomise drama "Shitennô Yagura no Ishizue"; for the first time his name appears on a theater playbill. 11th lunar month of 1816: he takes the name of Katsui Genhachirô and works with his master, Sakurada Jisuke II and Segawa Jokô II at the Kawarasakiza on the kaomise drama "Kiyomori Eiga no Utena", which also celebrates the shûmei of Sôryô Jinroku II, Ôtani Bajû II, Sakata Hanjûrô, Bandô Matajûrô III, Ichikawa Momotarô I, Tsuuchi Monzaburô III and Ichikawa Kodanji III. 3rd lunar month of 1817: premiere at the Kawarasakiza of Tsuruya Nanboku IV's masterpiece "Sakura Hime Azuma Bunshô" [casting]; Genhachirô works with his master on this masterpiece. 3rd lunar month: premiere at the Tamagawaza of Tsuruya Nanboku IV's drama "Sakura Butai Maku no Datezome" [casting]; Genhachirô works with his master on this drama. 11th lunar month of 1820: he takes the name of Katsui Genpachi and works at the Kawarasakiza on the drama "Ise Heiji Ume no Mitegura", which celebrates the shûmei of Onoe Tamizô II, Ôtani Monzô II and Iwai Kiyotarô IV. 7th lunar month of 1825: premiere at the Nakamuraza of Tsuruya Nanboku IV's ghost play "Tôkaidô Yotsuya Kaidan" [casting]; Genpachi works with his master on this masterpiece. 11th lunar month of 1825: premiere at the Nakamuraza of Tsuruya Nanboku IV's drama "Oniwaka Kongen Butai". The main roles are played by Ichikawa Danjûrô VII, Iwai Shijaku I (Osome) and Iwai Kumesaburô II (Hisamatsu). The michiyuki, which is called "Ukine no Tomodori", is still part of the current Kabuki repertoire; Genpachi, who becomes nimaime sakusha, works with his master on this drama. 9th lunar month of 1826: Seki Sanjûrô II, who is about to travel back to his native Kamigata after 19 seasons spent in Edo, performs his onagori kyôgen at the Nakamuraza. The program includes a 5-role hengemono written by Katsui Genpachi and entitled "Kaesu Gaesu Onagori no Ôtsue". The 5 roles are the Wisteria Maiden, a blind masseur, the God Tenjin, a footman (yakko) and a boatman. These roles are created based on ôtsue, popular paintings made in the city of Ôtsu (close to Kyôto). Three of these roles are still part of the current Kabuki repertoire: the Wisteria Maiden (the first version of the famous dance "Fuji Musume"), the blind masseur (performed under the title "Zatô") and the footman, which is performed in the independent dance "Sekisan Yakko". 11th lunar month of 1826: Genpachi works with his master and Matsui Kôzô II at the Nakamuraza on the drama "Kaeribana Genji no Kachidoki". 11th lunar month of 1827: Genpachi works as a tatesakusha at the Nakamuraza, along with Matsuchi Shôkichi, Segawa Jokô II and Katsu Hyôsuke, on the drama "Kinbusen Yosooi Genji", which celebrates the shûmei of Ichikawa Yaozô V.
21st day of the 1st lunar month of 1828 : Genpachi dies in Edo. Katsui Genpachi was an Edo sakusha, who was trained by Tsuruya Nanboku IV and worked on more than 30 original dramas or dance-dramas from the middle of 1810 to 1828. The most important ones were "Fuji Musume" and "Sekisan Yakko", which are still in the Kabuki repertoire and are regularly staged (especially the former dance-drama, which is one of the most popular dances). the 21st day of the 1st lunar month of the 11th year of the Bunsei era was the 6th of March 1828 in the western calendar. it is located in the Urawa Ward of Saitama City in Saitama Prefecture.